Could someone please explain to me the difference between the General battle magic cards and the army specific ones? I know the army specific ones are the magic and spells for that individual army so what are the others ones? Battle Magic cards are for the 8 Lores from the main rulebook used completely or in part by most races. Ie. armies have access to all or some of the rulebook lores. The magic cards for specific races are just that, magic cards for the race specific lores. So the High Elf one has High Magic that only HE now use. The Skaven deck should include the 2 lores Skaven can use Plague and Ruin IIRC. And so on and so forth. The Deamon magic cards contain the 3 Chaos Deamon lores and the Beastmen magic cards only the spells from Lore of the Wild. This is why you'll notice that the number of cards in each set varies considerably. The magic cards are strictly gaming aids, not required, should help you remember who has what spell and which unit is under effect of said spell. 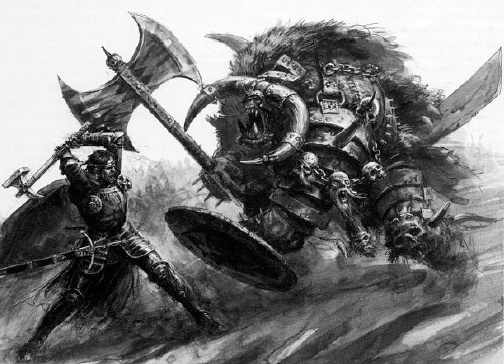 To give the "canon" explanation (or at least what I remember of the older stuff) then there is a raw stream of "magic" that flows across the Warhammer World. That raw magic can be used in different ways and has different aspects to it. The human wizards in the Empire split it into the eight Lores and set up colleges for each with a specific focus (e.g. Bright = fire, Amber = beasts,...erm, I've forgotten the mappings for the rest now - I was always more of a High Elf player). On top of all that then the High Elves and Lizardmen are supreme magic users and so pull out the purer part of the magic into spells, giving them High magic. Skaven eat warpstone (a solidified form of chaos/magic), which gives them their own range of spells, and similarly the Orcs get the Waaaggghh! as a powering force for their spells (a psychic force from their numbers and battle, although they believe it is from their gods), which gives them their own range of spells again. Chaos used to have a "lore" per god (except Khorne, the blood/warrior god), but it looks like GW might have dropped that recently. Or something like that They'll explain it in one of the rule books, or the Empire Army Book will explain the colleges at least. I liked the old magic sets from 4th edition....ahhhh, the good old days. The Chaos gods still have their specific lores. In fact there is a Deamon Lore of Tzeentch and Mortal Lore of Tzeentch, and so on. All magic comes from the Winds of Magic, how races perceive it differs though. The reason the Empire uses 8 colleges is because the Elfs found humans were only able to perceive a limited aspect of magic at one time. It's really a Magic for Dummies approach. This should also explain the other races lores, in so much they don't use different magic but perceive the whole in a different way filtered trough their particular traits. Skaven use the winds but augment their magic with warpstone, but it is not an exclusive source. We've come some way from the Orcs can make their own magic nowadays it seem as well, I can't remember exactly but I think they've lost the extra spell power generation. I don't have access to the armybook right now. I may need to check it. Funnily Lizardmen no longer have access to High Magic thought it was they who taught the High Elfs. Both have access to the full range though as they can perceive the true nature of magic. Not sure how the DE Dark Magic works now, it should be the opposite of High Magic but how it can be the opposite of the whole I don't know. Of course mostly when magic is described it is filtered through the perceiver so a Skaven talking about magic in the background would only be saying what they perceive. I've been out of touch with WH magic since the arrival of 6th Edition! I did have a nagging feeling that Lizardmen didn't use High Magic any more, but that's just crazy. The idea of "what you can perceive" makes sense, and was probably described somewhere. As for Dark Elves, surely they'd just have opposite intent? Magic is (I think) just a raw element that can be used, so High Elves can perceive and use all of it in the form of High Magic, and Dark Elves *should* be able to perceive and use all of it in some form of Dark Magic (which there used to be, IIRC). I don't quite remember Orcs getting extra spell generation from the size of the unit (although maybe I do - was that the bit that caused the shaman's head to explode? ), but it'd be a shame if they've moved the Orcs away from Waaagghhh power. IBBoard wrote: I've been out of touch with WH magic since the arrival of 6th Edition! I did have a nagging feeling that Lizardmen didn't use High Magic any more, but that's just crazy. The idea of "what you can perceive" makes sense, and was probably described somewhere. Yeah, this is why I keep correcting you. IIRC Lizardmen (Slann) still in 6th ed had access to the basic (8th edition calls these signature spells) High Magic "Drain Magic" spell, but since the 7th ed update High Magic is High Elf Magic. It is rather odd that the Slann did not get their own Lore though. Admittedly currently their "excellence of magic" is manifest in a rather tasty set of upgrades that combined with the utility of the 8 basic lores makes for one awesome, if pricey package. To some extent I am glad they got rid of the whole "who are the best mages competition" that 5th sort of suffered from, fluffwise mainly. IBBoard wrote: As for Dark Elves, surely they'd just have opposite intent? Magic is (I think) just a raw element that can be used, so High Elves can perceive and use all of it in the form of High Magic, and Dark Elves *should* be able to perceive and use all of it in some form of Dark Magic (which there used to be, IIRC). You are right. Makes absolute sense, especially if one buys my "race perspective view". I guess the High Elf player in me (yes I started out as one in 5th actually) just accepted that the HE version was the truth. Dark Magic would be the same complete package used in a Chaotic and uncontrolled manner. Dark Magic still exists and has become a purely Dark Elf lore going the same way as High magic in that sense. It is insanely (well, sort of) powerful but rather dangerous. And they even managed to resurrect some of 5th ed in a spell that generates power dice for the DE player. Very handy. 4+ gives you D3+1 dice. Throw two dice at it and at worst you get your own back and the enemy wasted dice against it. And there's a bunch of tricksy things one can do in conjunction to this. IBBoard wrote: I don't quite remember Orcs getting extra spell generation from the size of the unit (although maybe I do - was that the bit that caused the shaman's head to explode? ), but it'd be a shame if they've moved the Orcs away from Waaagghhh power. They did have that in 5th and also partly in 6th. You got more power dice for units of 10 orcs and 20 goblins in CC within 12" IIRC. I'm pretty sure they dropped it for 7th ed. I guess it sort of was "complicated". There's a new O&G book coming in March it seems so maybe they bring a bit of that back. They've been doing a lot of "retrofitting" recently.